In my new home my apple trees are infants about five feet high, but the day will come when I’m eating apples from my own trees, all heirlooms chosen for superb flavor. In the meantime the farmers’ markets are full of apples, and in a moment of impulse I bought an enormous bag of Winesaps. After eating all that I could fresh, I indulged my passion for fruit crisps. Desserts are seldom justifiable on purely nutritional grounds, but this one is a lot healthier than most, particularly because the peel is left on the apples. Try it. As long as you follow the directions, the peel won’t bother you a bit, and it adds fiber and antioxidants and saves time. Use organic, unwaxed apples. Ask to taste them first, because any apple is affected by its immediate conditions and the season. Don’t ever bother cooking with an insipid or mealy apple. Your time and effort will not be rewarded. I strongly advise cooking in a clay pan for best flavor. I keep a 10″ Spanish cazuela from The Spanish Table in Santa Fe, and find that it’s the most used pan in my kitchen, because I can use it on the stovetop or in the oven. I strongly advise reading Paula Wolfert’s “Mediterranean Clay Pot Cooking” for the ins and outs of using clay pots. Season the cazuela according to the directions that come with it, and follow the temperature and timing directions below closely. This dessert takes a few hours to make, but 90% or more of the time is unattended oven-cooking time, so you’ll get a lot of other things done at the same time. The whole beauty of this dessert is the pure flavor of the slow-cooked, semicaramelized apples, made a little richer by the vanilla. I definitely don’t recommend adding spices. Wash, halve, and core the apples, then slice into very thin slices lengthwise. Aim for slices 1/8″ thick, but if a few are a little thicker it won’t matter much. A food processor or mandoline is helpful, but I just use a good sharp knife. Don’t leave any really thick slices in, because the peels will be tough in the finished dessert, while very thin slices of peel become unnoticeable during the long slow cooking. In a large bowl, toss the apple slices with the cornstarch, lemon juice, agave nectar, vanilla, and salt. Pile them into the cazuela. They will probably have to be stacked up a little inn order to fit. Don’t worry, they cook down a lot. Pop the cazuela in the oven, set it for 300 degrees, and bake about 90 minutes. Stir once or twice during that time. If the apples seem to be browning on the bottom, turn the oven down some and stir a little more frequently. To make the topping, combine the oats, flour, salt, and sugar in a bowl. Cut the cold butter in chunks, then work it into the mixture with your fingers, making sure that it is “smooshed” well into the dry ingredients and no large chunks remain. Toss in the vanilla with a fork, then check the baking apples. After about 90 minutes they should be well cooked down. Pile the crumble mixture on top, return to the slow oven, and bake another hour. At that point you can turn up the heat to brown the top a little, or turn on the broiler for a minute or two, but don’t let it get darker than medium gold and watch carefully to avoid burning. Remove from the oven, let cool a little, and serve with vanilla ice cream on top, or cool it completely to rewarm at another time. It keeps at least a few days. The desert is not terribly sweet, and I love it that way. 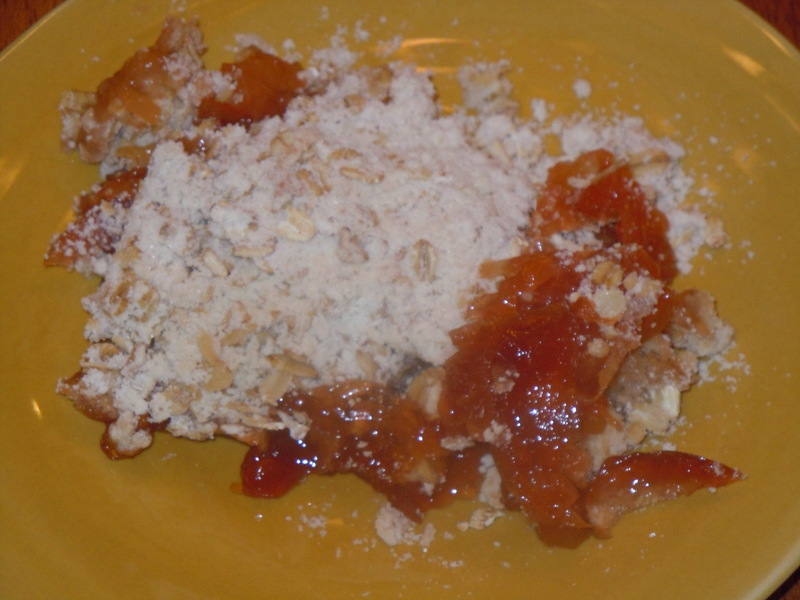 If you prefer, you can add a little more sweetener to both the apple mixture and the topping. This topping is very crumbly and crispy. If you want something more like a cake topping, you can add an egg and a little milk and a pinch of baking powder to the dry mixture, but keep it on the dry clumpy side and don’t stir it too much, or you’ll develop the gluten in the flour and make it tough. This version doesn’t reheat nearly as well as the crumbly version. Viva Fall! I love summer and hate to see it go, but the end of the harvest season has its own pleasures. Besides, it inspires me to dig more planting holes for more apple trees next spring.